Despite widespread warnings that time is running out for a two-state solution, even President Obama remains sceptical that a final status agreement will be reached in the foreseeable future. In the absence of any tangible prospects for advancing discussions on final status issues, the US President has lowered expectations, describing current US efforts as merely intending to “push the boulder partway up the hill and maybe stabilize it so it doesn’t roll back on us”. The role of Sisyphus in this case has fallen to US Secretary of State John Kerry, who has also been trying convince a sceptical Palestinian leadership to forgo efforts to advance statehood through multilateral fora following the end of current negotiations and commit to another round of talks. However, as Palestinians have learned from past experiences, putting off discussion on core issues – no matter how contentious – will not by itself lead to a peace agreement. As with past negotiations, this scenario would only perpetuate the status quo and allow Israel to further entrench its hold over the Occupied Territories. Instead of pushing Prime Minister Netanyahu towards making peace with Palestinians, the US has acted as an enabler of Israeli maximalism, allowing it to dodge compromise and dig in its heels. In its attempt to overcome issues thrown up by the Israelis to delay discussions on future borders, Washington has also ended up moving closer to Israeli positions than had been the case in previous rounds of negotiations. To ease Israeli concerns about security arrangements following Palestinian independence, for example, the US has now accepted demands for a continued (if limited) IDF presence in the Jordan Valley. Washington is also set to include Palestinian recognition of Israel as a Jewish state in its framework agreement along with some ambiguous language on the fate of Jerusalem. Nor has Washington succeeded in ending Israeli impunity within the West Bank, including rising settler violence and the issuing of tenders for some 5,439 new settlement homes since the start of the current talks. Yet far from winning over the Israeli leader, US acquiescence has only led to a hardening of Israeli rhetoric on many final status issues. At the same time, Prime Minister Netanyahu has reportedly upped Israel’s territorial demand, vowing that he “won’t concede the places others conceded in the past”, including those that lie outside the main settlement blocs but which are “important to the Jewish people” such as Hebron – altogether around 13 percent of West Bank territory. Even Netanyahu’s statement in Davos on the fate of settlers and the ensuing spat with his Economy Minister Naftali Bennett in no way indicate moderation from the Prime Minister. But contrary to many of his cabinet ministers Netanyahu is not actually opposed to a Palestinian state, although his vision is light years from that envisaged by the internationally accepted parameters. Thus, if negotiations stumble on past the April deadline there is reason to believe that the Israeli leader could reshuffle his governing coalition to respond positively to a US push towards an interim agreement that would, in turn, lead to the creation of a Palestinian state with provisional borders. Such an outcome would likely perpetuate the status quo, putting off indefinitely discussions on more contentious issues such as the establishment of a Palestinian capital in East Jerusalem and the right of return for Palestinian refugees. When it comes to fulfilling Palestinian rights and aspirations, a bad interim framework may end up being worse than no deal at all. Although it has so far chosen to remain on the side-lines cheering Kerry’s peacemaking efforts, Europe has an indispensable role to play in balancing the asymmetry in the US’ relationship with both sides. Moreover, thanks to close cultural, economic and scientific ties, Europe is also in a unique position to help moderate Israeli behaviour. In its attempts to affect Israel’s calculations, Brussels’ preferred tool has been the provision of incentives in the form of thickening relations despite having little to show for it. Undeterred by the failure of this strategy to nudge Israel in the right direction, EU Foreign Ministers decided to go one step further in their December 2013 Foreign Affairs Council Conclusion, promising Israel an unprecedented package of political, economic and security support within the context of a final status agreement. Yet even this failed to elicit anything more than deafening silence, leading to visible irritation amongst European officials and the conclusion that Israel has become so gorged on European carrots that there is very little left on offer that would incentivise it to make concessions towards the Palestinians. In fact, as the ECFR’s recent Two-State Stress Test highlights, Europe has achieved far more by pursuing disincentives which aim to move Israeli political and public debates more in the direction of decisions needed to end the occupation. At the forefront of this has been measures designed to reinforce the distinction between Israel and its settlements, including the precedent set by the European Commission’s issuance of guidelines that prevent EU funding for Israeli entities beyond the “Green Line”. To be sure, taking a firmer line with Israel is but one of many necessary steps to achieving a credible peace process. But given the low priority attributed to the Palestinian issue by the Israeli public, and the growing opposition amongst Israeli politicians to a two-state solution, the ability to drive home the consequences of continued occupation and the price of losing European support constitute a crucial element in the two-state equation. 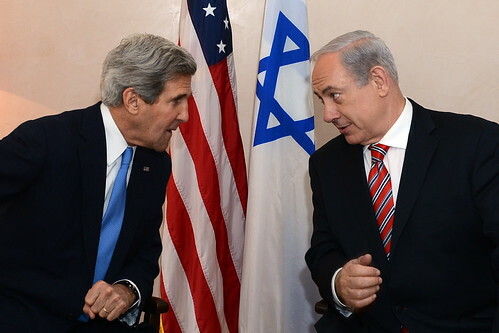 The Kerry Initiative: Cometh the Hour, Cometh the Man?